I’ll admit, it’s a splurge, even by Coach standards… but considering the medical debt I am in, what’s more money? lol. In all honesty, if you are a regular reader or know me IRL, you know I’ve not spent a penny on a handbag in like, 9 months. That is a record for me, and records are made to be broken! 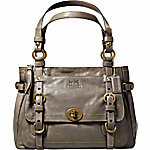 I am addicted to handbags, ESPECIALLY Coach and that bag is a NICE score! How exciting! You totally deserve it and I’m wishing you all the luck and sending you lots and lots of good juju!!! yay!!!! I think its great to splurge admist the wonders of IF treatments! ohhh it is soo pretty! Love the bag and I don’t blame you for splurging, it’s hard to constantly keep denying oneself life’s pleasures and for me that definitely includes handbags!Good luck with your transfer, I am thinking about you. I love that bag…hot, hot, hot.